An Election Day holiday might not increase turnout, studies demonstrate. Studies show increasing voter turnout—especially for working-class voters—is more complicated than declaring a holiday. 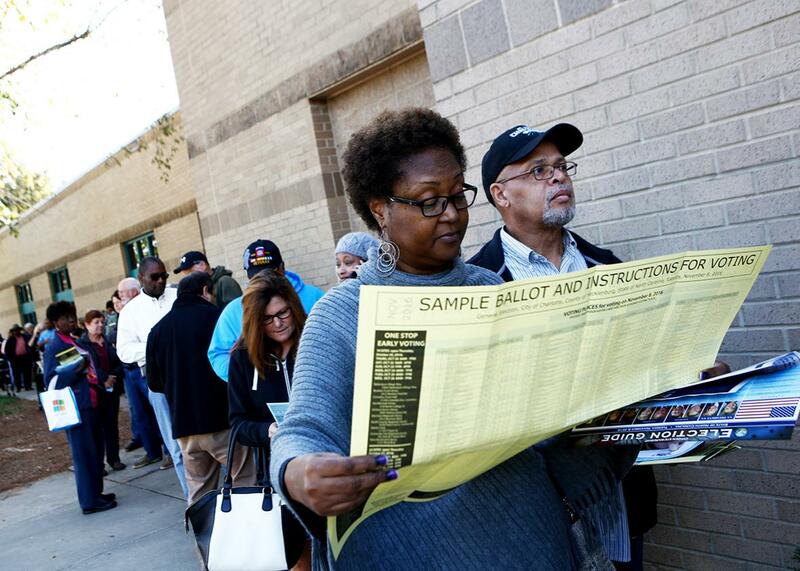 Mavis Wilson looks over a sample ballot as she waits to vote with her husband, Ron, at Charlotte Mecklenburg University City Library on Oct. 24 in Charlotte, North Carolina. Every Election Day, millions of Americans try to wrest enough time away from work to vote. And millions of them fail. According to the Census Bureau, about 28 percent of registered voters who failed to vote in 2014 said they were too busy to do so—far more than those giving any other excuse. Being busy was also the most cited reason for not voting in 2012, 2010, and 2008. A (small-sample) Pew poll from 2014 found that 35 percent of registered voters who failed to vote in 2014 specifically cited work and school conflicts as impediments. Consequently, every year many voters raise the same question: Why can’t we give people a day off to do their civic duty and cast a ballot? Concern for these voters motivated a 2005 bill from Rep. John Conyers and a bill last year from Bernie Sanders that would turn Election Day into a federal holiday, Democracy Day. Neither bill has gone anywhere since introduction, but that doesn’t mean the idea doesn’t have popular appeal. Last year, a coalition of progressive groups launched a campaign to have President Obama give federal workers a paid day off next Tuesday. That isn’t happening, but Obama did signal support for an Election Day holiday, along with other proposals aimed at boosting voter turnout such as weekend voting and automatic registration, in an interview with the Rutgers student newspaper over the summer: “Everything we can do to make sure that we’re increasing participation is something that we should promote and encourage,” he said. Retail. Restaurants. Hospitals. Smaller businesses that can’t afford to lose a day of revenue, and if they do, they certainly can’t afford to pay people for the time off. What does that mean? If you make election day a federal holiday, you’ll have all the people who work in these types of jobs still having to work, being inundated with customers who have the day off and they won’t have child care because the schools will be closed. The question of who would benefit from an Election Day holiday is further complicated by looking more closely at the Census Bureau’s data on nonvoters. In 2014, registered voters from households making more than $150,000 a year were the most likely to say they were too busy to head to the polls—more than 35 percent of them claimed so, while none of the income brackets less than $40,000 had more than 25 percent of respondents report they were too busy. Unsurprisingly, lower-income nonvoters are more likely than wealthier nonvoters to cite illness and disability or trouble getting to the polls as problems. Wealthier nonvoters, less impeded by these kinds of challenges, say they have mostly their schedules to blame. Given this, an Election Day holiday would remove a significant barrier to participation for relatively well-to-do potential voters while doing little to make voting easier for a significant number of less privileged ones. Even if Walk succeeds in having an Election Day holiday join in-office massage and pet-friendly workplaces as a standard Silicon Valley perk, it’s not at all clear how many workers would actually use the day to vote. Low turnout is a complicated problem and some of the more obvious seeming remedies haven’t really worked. For instance, moving Election Day to a weekend, which would also remove work as an obstacle for many, is commonly supported on the grounds that most countries with weekend voting have higher turnout rates than the U.S. But an analysis of voter turnout in democracies since 1945 determined that while countries with weekend voting do tend to have higher turnout than the U.S., adopting weekend voting hasn’t actually increased turnout within countries that have it. For what it’s worth, America’s turnout rate in 2012—53.6 percent of the voting-age population—was roughly the same or higher than recent turnout rates in a few countries with weekend voting including Poland (53.8 percent in 2015) and Japan (52 percent in 2014). Switzerland, despite weekend voting, the mailing of ballots to all citizens, and the availability of online voting in some jurisdictions, has the lowest voter turnout rate in the developed world—38.6 percent. For many there and elsewhere, election weekend is just another weekend. Similarly, there’s nothing that would stop voters here from treating a Democracy Day like just another day off. Of course, increasing voter turnout isn’t a lost cause. Research suggests that automatic and Election Day registration could have modest but positive impacts on turnout. (Early voting, another favorite proposal of election reformers, may actually decrease turnout by discouraging people to show up on Election Day.) Stopping the Republican Party from disenfranchising low-income and minority voters also wouldn’t hurt. But it’s unclear how much an Election Day holiday would help bring the most vulnerable voters to the polls. Indeed, it’s unclear whether it would bring very many more people to the polls at all.